Abe was indifferent. Zeke was a step up from that–fond? bemused?–whatever implies a distant affection. 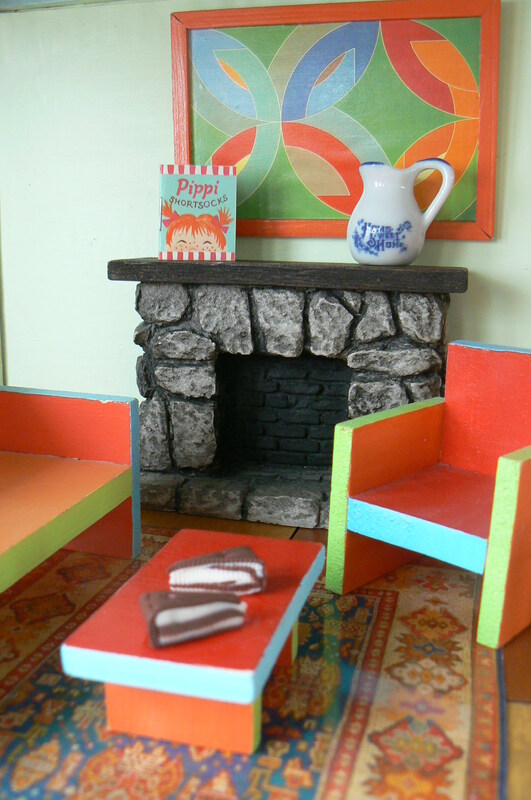 It was clear: neither of my kids toppled head over heels in love with the dollhouse I rescued from the curb, took home and painted, papered, and decorated with homemade furniture and–get this–a miniature Frank Stella. 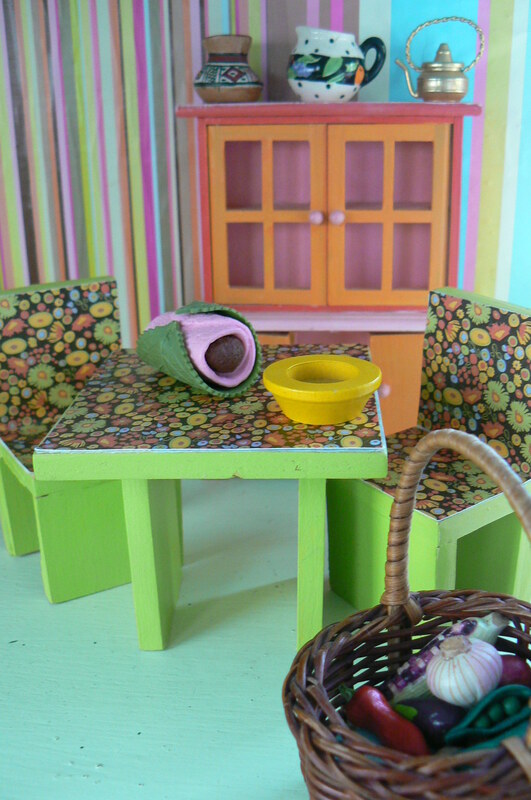 I sewed tiny pillows & stitched mini felt blankets. I made side tables out of those plastic thing-a-ma-bobs that come in the middle of pizzas. Bunk beds. Books as big as postage stamps. A bath mat the size of a match box. 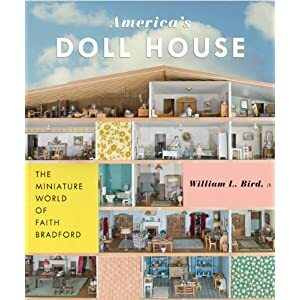 Sometimes, it takes a village to love a dollhouse. First it was Sophia Alvarez, my seven-year-old neighbor. 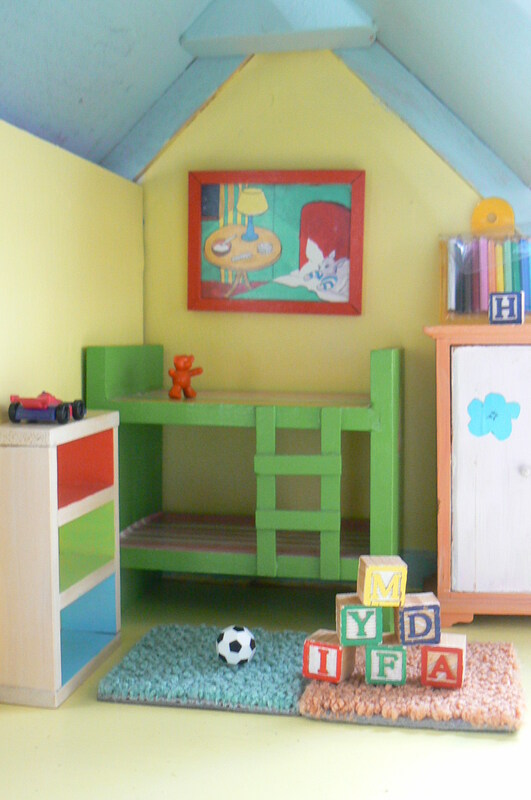 When she wasn’t constructing a Playmobil megalopolis in her bedroom, she’d come over and rearrange the dollhouse furniture for me. Over the years came other caretakers–Addie, Lila K., Lila M., Sophie U., Sophie B., Mary, Danny, Norman, and every teenage babysitter I have ever hired. It ends up I’m not the only one who appreciates the little things of life. So if you’re with me, make sure to check out these shrunken exemplars of pristine Modernism in a NYT slide show. 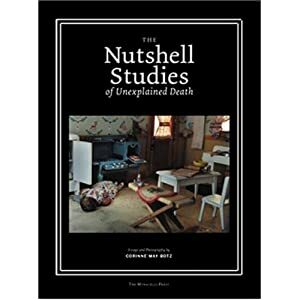 Or creep yourself out with this slideshow of shoebox crime scenes beautifully photographed by Corinne May Botz in The Nutshell Studies of Unexplained Death.